"Why do I keep buying this junk?" The box was half off, so $1.50 for 12 treats, and I'm still not sure if I feel ripped off or not. Let's see, that makes it 12.5 cents a treat, but now that I think about it, it's a better deal than the 50 cents a piece I paid for those pathetic low-fat Hood ice cream sandwiches. Ok, maybe not the kindest of words, but hey, it was a choice between "pathetic" and "awful". First off, they look nothing like the picture. The picture has a finely ground crust of tasty bits, the real thing has big pieces of crust that don't even form a complete layer, you can see right through it! The "vanilla" is typical low taste / low quality Hood vanilla. Lastly, the picture implies a liquidy center ...not even close. There is only one good thing I can say about these things: by the end of it, I was mildly tempted to have another. I think my taste buds were starting to get use to the cheapness of the whole ordeal. I'm sure I'll have another one tomorrow and we'll see how I feel about it then. On Second Scoop: Lowered expectations can be a beautiful thing. 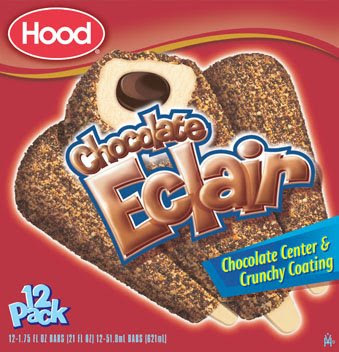 The eclairs aren't about to win any taste awards, but for 12.5 cents, and for a mild chilly break (was it less than ten bites? I should have counted), they aren't the worse thing in the world and I'm really debating a second one at the moment. I did find one thing I like about them, the little eclair bits, it's just a shame there aren't more of them.